Don't let my ever-so-slightly-roundish figure fool you...it's clearly just a bad camera angle. Or possibly a little water weight from my last stop at the fountain. My official *weigh-in* at the V-E-T was postponed, so I'm going in this Wednesday. Glogirly says I feel light as a feather. I BETTER feel light as a feather what with Waffles chasing me chasing Waffles around the Townhouse all the time. And don't even get me started on the food shenanigans. For someone who doesn't care much about HIS food, Waffles sure cares a lot about MINE. He claims he's innocent. But don't let this serene monochromatic photo fool you. He's simply plotting his next caper. The real reason we've gone monochrome this Monday is because we are thinking so very much about our dear friend Abby, from Manx Mnews. She is gravely ill and we are very worried about her. Her mom's heart is breaking, and so are ours as we read her updates and deep-from-the-heart thoughts about her sweet girl. I am very sorry for your friend. We send goat hugs and cat purrs for her. Sorry to hear about youe friend being very ill! We hope she pulls it through! You look just marvelous Katie! This is such a beautiful sentiment for Abby. She is in my thoughts and prayers. We are so worried about Abby. We hope that her Mama gets better news tomorrow when she sees the specialist. She is a very loved little girl. We're all purring hard for Abby and her Mom. It's just so incredibly hard when our fur babies are sick. These photos are all very cool, but esp. yours, Katie. You look like you are striding with a purpose. Everypawdy has whiskers crossed for Abby! Don't worry one bit about your divine feline self, gorgeous Katie, we think you're purrfect! Don't they say something about the camera adding 10 pounds? Wonder if it applies to cats too? I personally think you're looking great though - good luck at the vet! These are lovely photos! And we have been purring lots for our friend Abby! Sorry to read about Abby. Our paws are crossed for her and her peeps. Have a marvellous Monday K&W. I am sure you will have a great weigh-in, Katie! We are all purring lots for Abby - we too are very worried about her! How wonderful of you to dedicate a day to dear Abby. Beautiful. 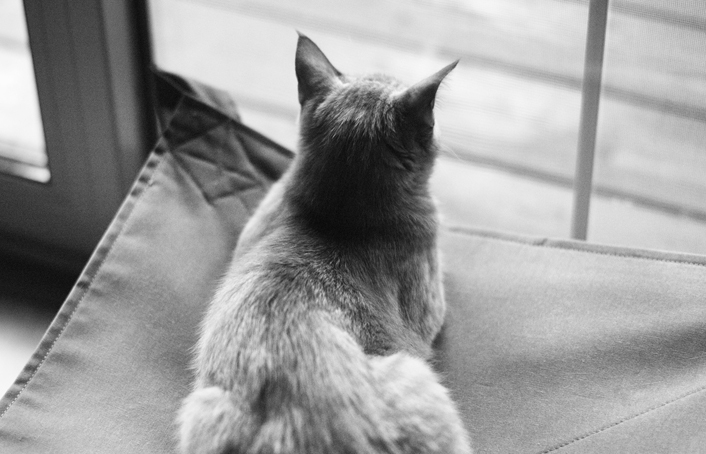 Watching a good friend's kitty in pain or struggle with illness is so very heartbreaking. We just had to comfort our mom a bunch because one of her good friend's kitties, Amber, fought a long battle with cancer and finally went to the Rainbow Bridge. We will go leave them some purrs. We hope that she gets well very soon!! Katie, we hope you won't have to be on a diet much longer; that does not sound like fun! Fingers and paws crossed for your weigh in! We're purring for Abby too! As you miaow that photo is just taken from a very bad photoangel ! We're purring fur Abby too. You look beautiful to us, Katie. 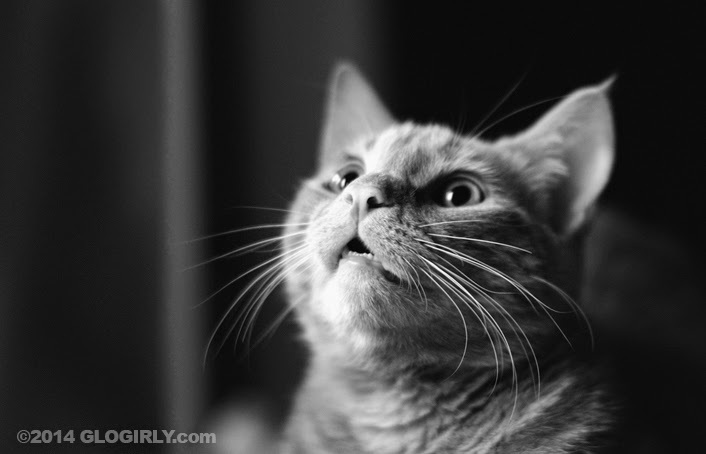 We're not fooled ... We see a maniacal glint in Waffles' eyes. You're wise to be alert! Have a good week! It is just the way you are shown in that picture that seems to add a little to your girth. Look at your lEFT side, not your RIGHT. It is so upsetting how sick Abby is and we really are praying for a miracle. Beautiful Katie!! You are looking svelte and ever so chic in monochrome!! Lovely Waffles Too! Awwww you are innocence personified - or should we say, cattified!?! LOL! We hope your weigh-in goes well, Katie. We continue to purr very loudly for both Abby and her mom. We will be praying for Abby and her mom. Very nice post. If we didn't know better, and we do, that does look an awful lot like some belly swing action going on. But we know it's all down to the photographer and poor framing abilities. Beautiful photos of Katie and Waffles! Very sorry about your friend Abby. We will keep her in our prayers. What a sweet post! We're so worried about Abby, too. 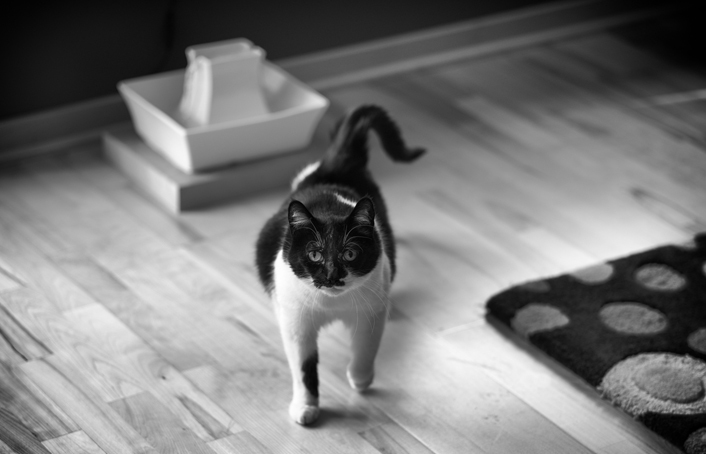 You tuxie girls have a way of winding yourselves into our hearts! We are purring like crazy for Abby. Katie, it's the "lure of the forbidden". Why go for YOUR OWN food when attempting to steal others' noms is SO much sweeter - especially if you SCORE? We're very good at standing on three legs for our weigh ins, Katie! Sorry for your friend. My thoughts and prayers are with her. I never realized Abby was one of my Twitter furrends too until last night. I started a #pawcircle for her and we're camping out on #Abbysporch. I hope she can fight this off and get well. And, no, you don't look rounded. BTW, I presented you with an award, Katie. You look great Katie! We are all so very worried about sweet Abby. Feel better soon Abby. You look great Katie. Stay out of trouble, Waffles! We love Miss Abby and her mom, too. We are purring and praying for them with all of our might. 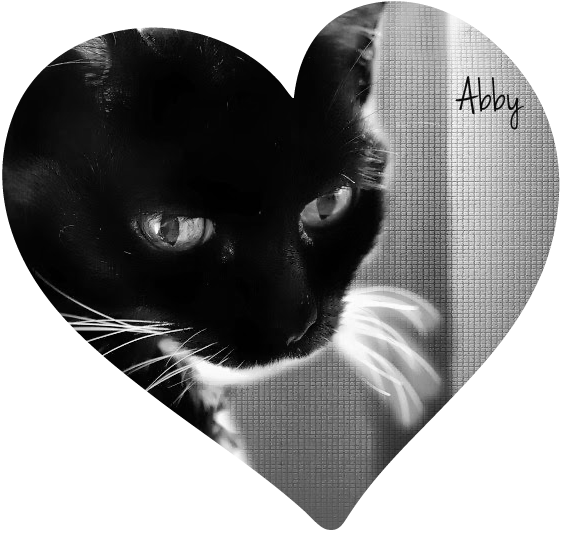 Everyone is sendin' so many purrs for Abby and it's such a WONDERFUL thing to hear. All those purrs... All that love... Purrs and prayers perform miracles, for sure. We send many get well purrs to Abby. Monochromatic looks good on you, Katie. Yeah, and Waffles too. Sending hugs and purrs to Abby's mom. Beautiful kitties, in color or not. You two are so beautiful and it is a joy to see you always. Abby's illness has mom in tears. I pray Abby will stabilize. Her mom is so sad.